The global OLED market was valued at USD 16.58 billion in 2016 and is expected to grow at a CAGR of 15.2% between 2017 and 2023. The key factors driving the growth of the market include the rapid adoption of OLED displays in smartphones and the growing investments in technology and manufacturing facilities. The base year considered is 2016, and the forecast period for the market has been considered between 2017 and 2023. OLED is a new and exciting technology providing thin, efficient, and bright displays and lighting solutions. Many industry experts believe OLEDs are set to replace existing technologies in display and lighting space. In a view of this, many companies started investing heavily in R&D of OLED. There are several players involved in the value chain of the market; these include companies researching on OLEDs and acquire important patents relating to OLED materials; chemical companies involved in the OLED material production; panel manufacturers, and customers that use OLEDs in their products such as smartphones, TVs, and other consumer electronic products. For instance, in February 2015, LG Display announced its plan to invest USD 915 million for the OLED TV production capacity expansion. This expansion enabled LG Display to produce 0.6 and 1.5 million OLED panels for TV in 2015 and 2016, respectively. Companies such as BOE Technology (China), Tianma Microelectronics (China), Truly Semiconductors (China), AU Optronics (Taiwan), EverDisplay Optronics (China), GoVisionox Optoelectronics (China), and JOLED (Japan) have already announced the OLED production capabilities with partial production in 2016 and mass production by 2018. 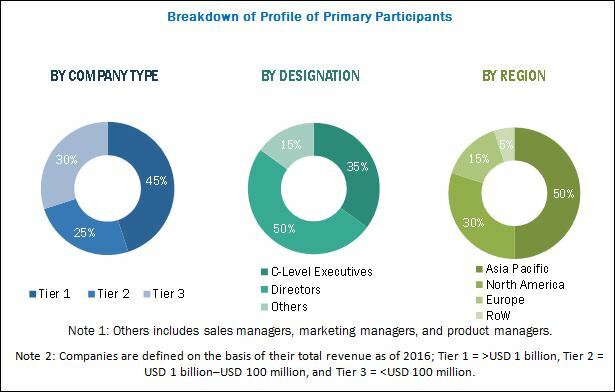 This report provides valuable insights regarding the ecosystem of OLED market, such as research & development, material development, display and lightning panel manufacturing, device assembly and testing, distribution, marketing & post-sales service. Key players operating in the market include Samsung Electronics (South Korea), LG Display (South Korea), AU Optronics Corp. (Taiwan), JOLED (Japan), and Universal Display Corp. (US). Other major players in the market are Foxconn (Sharp Corp. & Innolux Corp.), Pioneer Corporation (Japan), BOE Technology (China), Royole Corporation (US), Everdisplay Optronics (China), Acuity Brands (US), OSRAM (Germany), Kaneka Corporation (Japan), and OLEDWorks (US). How much growth is expected in OLED market from smart wearables, and why OLED is essential for AR/VR growth? 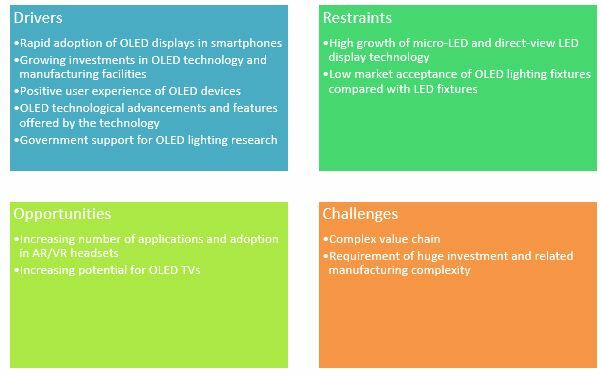 Which are the top use cases/applications/industries of OLEDs to invest in, and what are the untapped opportunities? How the demand for OLED displays will shape in the next 5 years for newer and emerging applications? Where will the current developments take the OLED supply chain in the mid to long term? With the given market data, MarketsandMarkets offers the following customization options available for the report. Organic light-emitting diode (OLED) emerged as an advanced and self-emitting display technology for efficient, bright, flexible, and thin display panels. OLED displays are made from organic light-emitting materials and do not require any backlight panel. Since 2015, OLEDs have witnessed rapid adoption in smartphones and wearables. The global OLED market was valued at USD 16.58 billion in 2016 and is expected to reach USD 48.81 billion by 2023, at a CAGR of 15.2% between 2017 and 2023. The key factors driving the growth of market include the rapid adoption of OLED displays in smartphones and the huge investments in the technology and manufacturing facilities. Smartphones accounted for major share of 83.5% in OLED display panel market in 2016. The major factors that are boosting the use of OLED displays in smartphones include the benefits offered by OLED including energy-efficiency, high brightness, and thin form factor compared with LCD display panels. AMOLED screens have great contrast, as the light on the screen comes from each individual pixel rather than an LED backlight; when it needs to create a black color, it simply dims or turns off the relevant pixels, for a true, deep black, which consumes less power. Televisions are likely to account for the second-largest share of the display market by 2023. 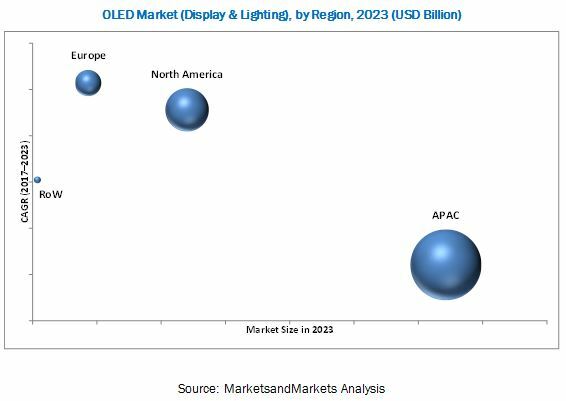 The OLED lighting market is at the early phase of growth and is expected to grow at a high CAGR during the forecast period. Flexible display panels held a lower market share compared rigid ones in 2016; however, the market for flexible display panels is expected to grow at a higher rate during the forecast period. With the increasing use of flexible display panels in smartphones and smart wearable devices, and their potential use in other applications such as TVs, signage displays, and vehicles, flexible displays are expected to drive the growth of the market during the forecast period. Fine metal mask (FMM) RGB materials are used to manufacture small display panels for smartphones and tablets; these materials accounted for a larger share of the market for AMOLED displays in 2016. However, the market share of FMM RGB is expected to decline owing to the increasing adoption of WOLED materials by LG Display for use in TVs. Large display panels are used in TVs, which require more OLED materials compared with smartphones and tablets. The full-fledged production of WOLED-based large-sized display panels started in 2015–2016 when LG launched TV and signage displays based on the OLED technology. The consumption of materials for use in large-sized white OLED panels is expected to increase rapidly each year throughout the forecast period. General lighting accounted for a major share of OLED lighting market in 2016; however, the market for automotive lighting is expected to grow at a higher rate between 2017 and 2023. The high growth in automotive lighting can be attributed to the expected demand from luxury car manufacturers for premium quality lightings, along with the collaboration among OLED manufacturers and leading automotive companies for the development of flexible lightings for vehicles. Asia Pacific accounted for the highest demand in OLED market in 2016, especially from South Korea, China, and Japan as major original brand manufacturers are based in these countries. The display market in North America is expected to grow at a high CAGR during the forecast period owing to the increasing adoption of OLED display panels by Apple in its smartphones. Early adoption of OLED lighting panels by leading automotive players in Europe is expected to propel the growth of the lighting market in Europe. Automotive players such as BMW and Audi have used OLED lighting solutions in their cars. Factors such as high growth of the market for micro-LED and direct-view LED display technologies, and low market acceptance of OLED lighting fixtures are restricting the growth of the market. Samsung Display (South Korea) and LG Display (South Korea) are the leading players in the market; however, various players such as AU Optronics (Taiwan), JOLED (Japan), and BOE Technology (China) are expected to increase their market share in the coming years by constructing new OLED manufacturing plants and acquiring newer customers. The leading players in OLED lighting market are LG Display (South Korea), Acuity Brands (US), OSRAM (Germany), Kaneka Corporation (Japan), Universal Display Corp. (US), and OLEDWorks (US).